A populous that is educated, informed and knowledgable is one which moves towards progressive changes in a society, both local and global, in order to better improve their collective living experiences. Ride-Arc has been providing fun and free events that investigate the connections between built social and sensory environments with the intention that we can have a better understanding of how we navigate within the spaces we create and the spaces that create us since 2006. We navigate in depth, bringing forth an understanding of how all of what surrounds you is connected, breaking away from the enclaves that many gravitate towards or create, enclaves which ultimately divide us in too many ways. Ride-Arc has always been and always will be free. All you truly need to participate is a bicycle, your presence, and an open mind willing to experience and share with others both near and far. 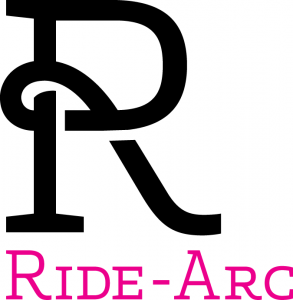 There is a Ride-Arc this Friday evening and there will be more Ride-Arc events to come. September 23rd, October 21st, and November 11th. Updates are provided through our mailing list. and we’ll add you at the earliest opportunity. The third announcement for our event on November 11th has been sent out to the mailing list and is copied below. of our megalopolis that many of us call home. The denouement of our three part series entitled “Epicentral West” will be presented this coming Friday, November 11th, at 8pm. We will be meeting on the street outside the 18th Street Arts Center in Santa Monica, just a pedal stroke away from the 17th/SMC Station of the Expo Line, which coincidentally is not the station depicted in the graphic for this final iteration of exploring how we can somehow manage to live together despite our default fear of change. In our first episode we visited through several different neighborhoods which have gone through, or are going through, various stages of gentrification: from early stages of resistance through the “post-mortem” phase of Hollywoodification. Interplayed through this primary topic were outstanding issues of homelessness and incarceration, affecting the shifting tides of a moving, and growing, populous looking for a place to live. Stemming from the “axis of justice” in the center of downtown Los Angeles, through the interstitial masses finding shelter in the area formerly known as Skidrow, flanked by warehouses of frozen foods, and walled by the tragically hip. In our second episode we shifted our gears and attention to the canyonlands of South Park (not the fictional town in Colorado), and crossed beneath the local Berlin Walls which intentionally separate communities in order to find a part of the city which remains unnamed. A potential next ground for development of any sort, the streets do in fact have a name despite U2’s best attempts at a serenade, yet tragic statistics of a hidden population brace against the growing temptations from the University of Southern California and the towering waves of high-rises seeking new grounds. This Friday evening, we embrace a different reality entirely in a tale of two cities, neighboring siblings competing for the prize of how best to deal with an unhindered tide of growth and desire of place, seeking to define itself in a distinguished manor of gleam. We will explore what we’ve taken from the first two episodes of this Ride-Arc series and feel the crisp wind of change grace against our cheeks. 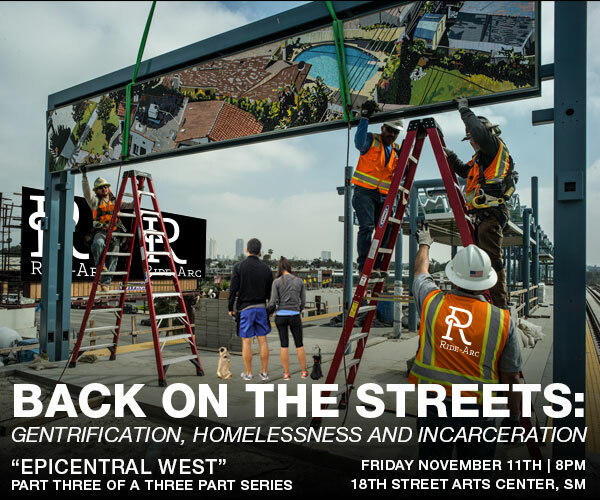 It’s part three as we ride the waves of gentrification, homelessness and incarceration. Won’t you join in? When: 8pm, Friday November 11th, 2016. **Coincidentally, local election results will effect the route! See, your vote does count: please do not squander an opportunity to express your voice. We will be starting promptly at 8pm with an initial discussion lasting a few minutes. If you are used to “bike time” arrivals that are a bit lax, please adjust your “bike time” clocks to cycle early so you might arrive on time. The initial discussion is vital in framing the remainder of our evening’s journey, and be prepared for a deep dive from the start. If you attended the first and second parts, some of this may be a repeat. At least this time you’ll know where you may want to focus your thoughts of the past in order to help your Self in the now. We will be riding in the streets and try to follow traffic laws as much as possible. Generally please avoid ‘corking’ intersections. We will wait for your group to catch up. The pace will be kept relatively easy. Please communicate with each other so we can avoid ‘dropping’ people unnecessarily or waiting for people who have decided to abscond themselves from the flood of mental stimulation on the ride. A bicycle in good or excellent mechanical condition. Your fondest memories of the comedy sitcom “Three’s Company” which was supposedly set in Santa Monica.